(Photo: REUTERS / Max Rossi)Pope Francis holds the statue of baby Jesus at the end of the Christmas night mass in Saint Peter's Basilica at the Vatican December 24, 2014. 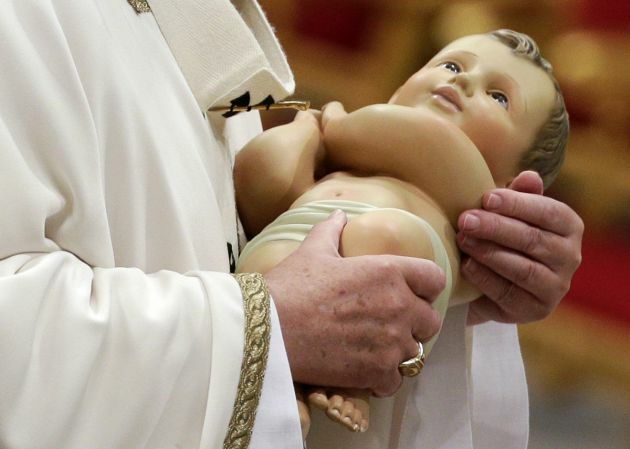 Pope Francis has condemned the "brutal persecution" of children in tyranny against Christians and other minorities by Islamic State extremists praying that the celebration of the birth of Jesus at Christmas will give them hope. The Argentine pope was delivering his second "Urbi et Orbi" (to the city and the world) address to tens of thousands of people at St. Peter's Square in the Vatican delivering his yearly blessing and message. "Today I ask him, the savior of the world, to look upon our brothers and sisters in Iraq and Syria, who for too long now have suffered the effects of ongoing conflict, and who, together with those belonging to other ethnic and religious groups, are suffering a brutal persecution," Francis said. "May Jesus save the vast numbers of children who are victims of violence, made objects of trade and trafficking, or forced to become soldiers; children, so many abused children. May he give comfort to the families of the children killed in Pakistan last week." Pope Francis prayed for the protection of "all those who suffer in Ukraine," and the overcoming of tensions, conquering of hatred and violence, and starting "a new journey of fraternity and reconciliation." Without using their name he condemned brutal fighters from the Islamic State who use the name of Islam to massacre, maim, render homeless and enslave Shi'ite Muslims, Christians, Yazidis and others in Syria and Iraq, the Vatican said in a statement. "May Christmas bring them hope, as indeed also to the many displaced persons, exiles and refugees, children, adults and elderly, from this region and from the whole world. He urged peace on the African continent, "thinking especially of Libya, South Sudan, the Central African Republic, and various regions of the Democratic Republic of the Congo." The pontiff beseeched those who have political responsibility "to commit themselves through dialogue to overcoming differences and to building a lasting, fraternal coexistence." Later he departed from his text and spoke emotionally of "children displaced due to war and persecution, abused and taken advantage of before our very eyes and our complicit silence." Reuters news agency reported. "I think also of those infants massacred in bomb attacks, also those where the Son of God was born," he said, without elaborating. Again without elaborating, he spoke of "contemporary Herods," with blood on their hands. The Pope was referring to the Biblical king who ordered children to be killed because he saw Jesus as a threat to his power. He condemned abortion as a product of "a culture that does not love life" when he spoke of "infants killed in the womb."